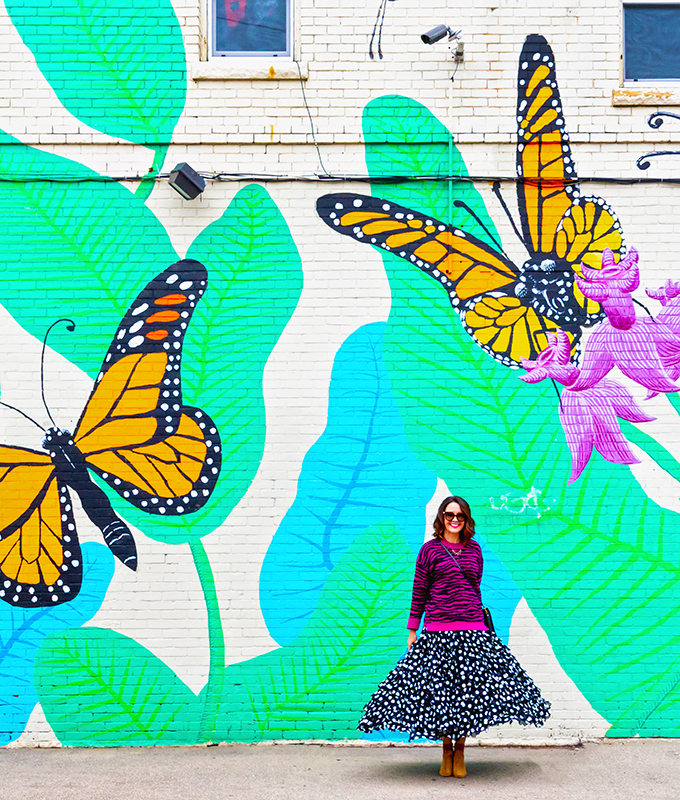 Our colors for each month are always colors we love and feel connected to, and we don’t like to pick favorites. However, if we had to pick a favorite, it would, hands down, be pink. 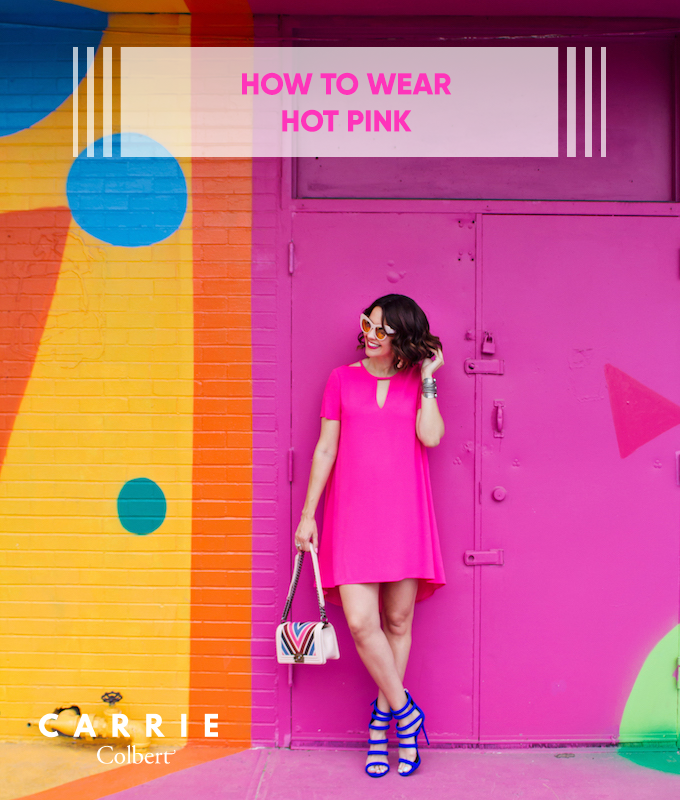 Pink is our main color over here at CarrieColbert.com, and we love it immensely. So you can imagine the excitement we feel right now that it’s our February color. I know I know, pink in February? Not so groundbreaking. However, we’re not talking just any pink. We’re talking hot pink. We’re talking the boldest kind of pink there is. The meaning of the color pink is unconditional love and nurturing. 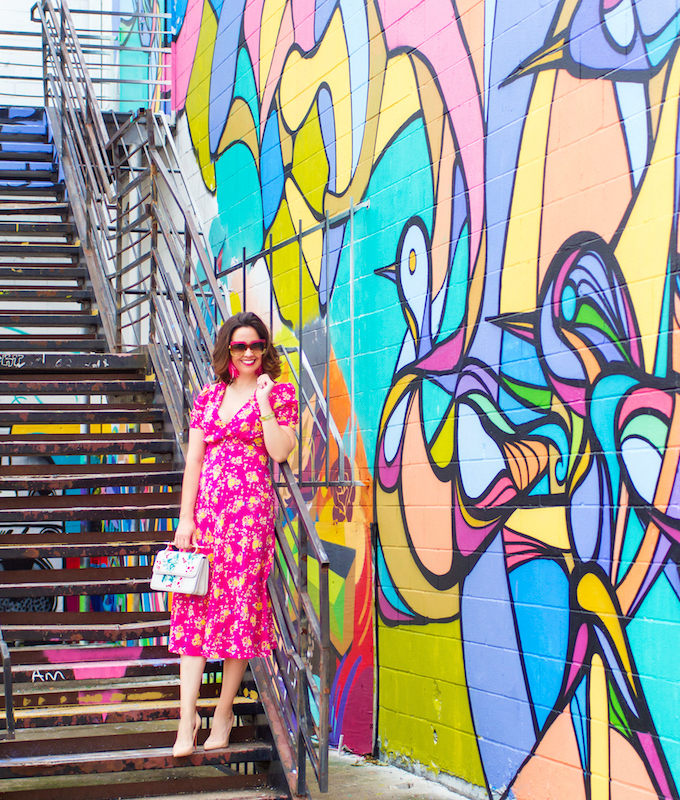 While that is more so talking about a lighter shade of pink (see our blush pink articles here and here), it can still hold true for hot pink. But with the added saturation, hot pink can also take on the meaning of passion and energy. When we see hot pink we immediately light up. It can help one feel empowered and bold and ready to take on whatever comes their way. It’s a strong color and it stands out. Hot pink doesn’t blend in with the others. Hot pink stands on its own! 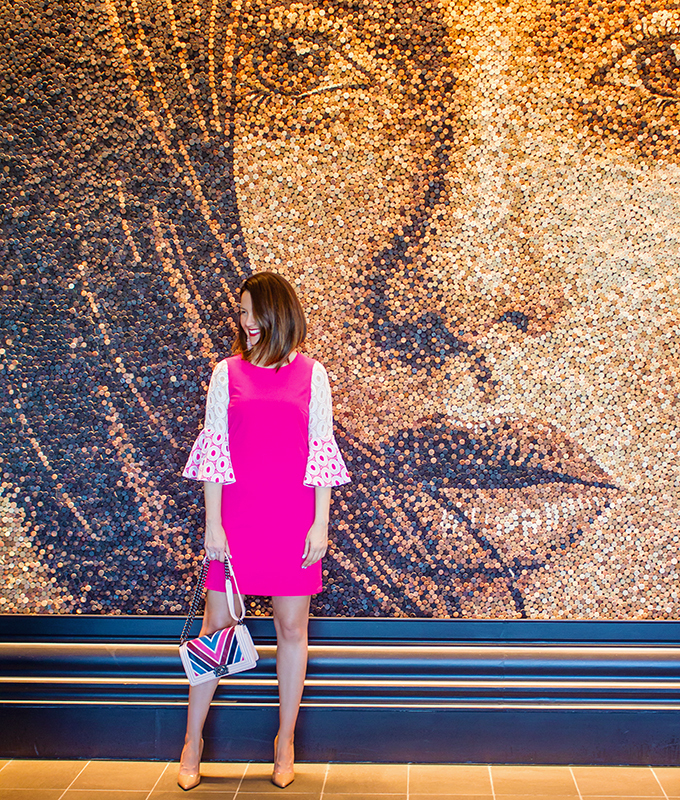 When it comes to hot pink in fashion, the same holds true. When you wear hot pink you are going to stand out, look bold, and show confidence. Hot pink can be a showstopper. It can bring a smile to anyone’s face, and it’s simply fabulous. Now, how does one wear hot pink? Keep reading. 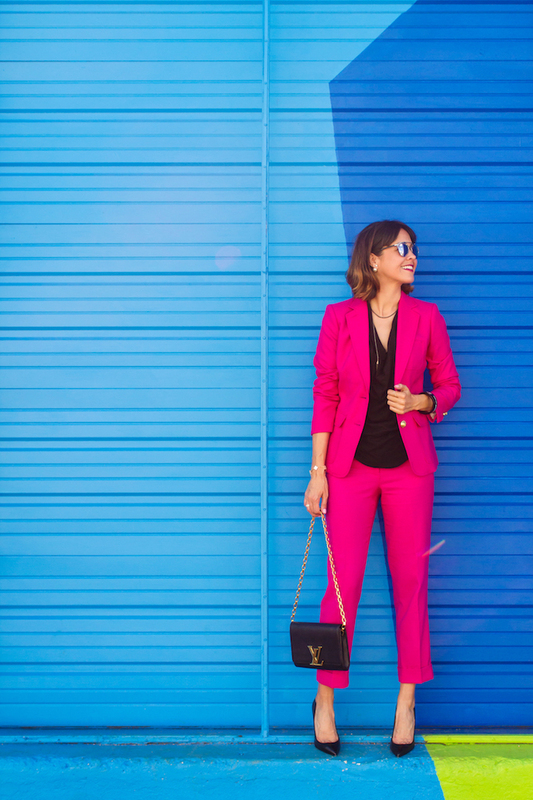 That’s right – go bold with not just the color hot pink, but with the fabric, too. 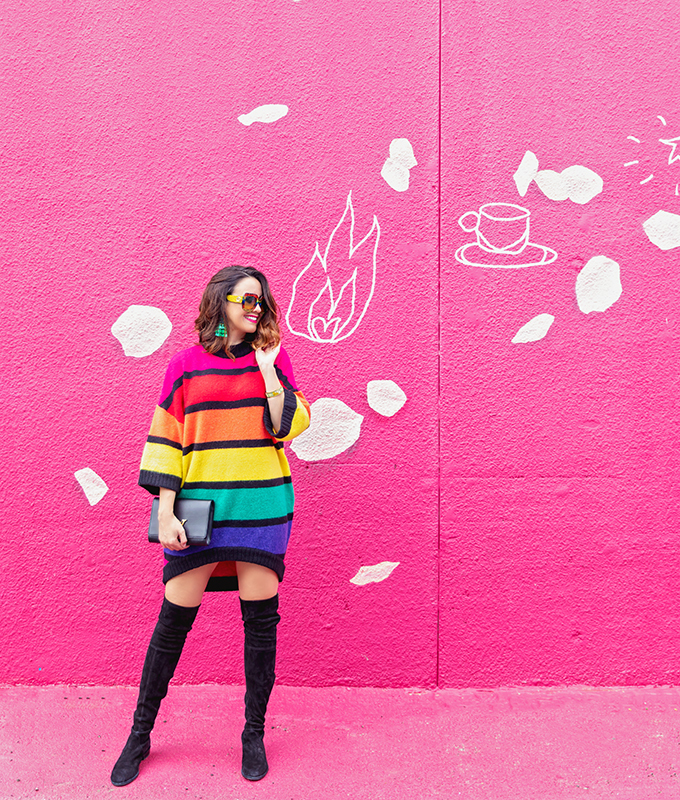 You know we love rainbows as much as we love hot pink, so why not incorporate the two? Whether it’s white accents within the same piece or in your accessories, the contrast works perfectly. Animal print is as bold as hot pink is, and we love combining the two. This striking color combination we’ll never get tired of. This is a timeless duo – pink and florals. Both are feminine and they look wonderful together. 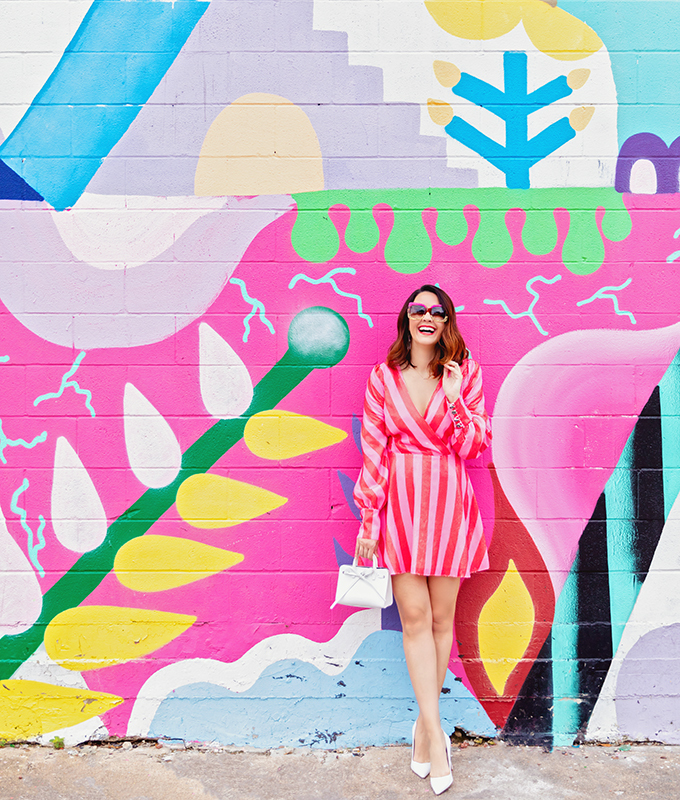 A hot pink romper is downright show stopping. This is especially great for certain work settings – the black tones down the hot pink and looks super chic. Oh how much we love this one! 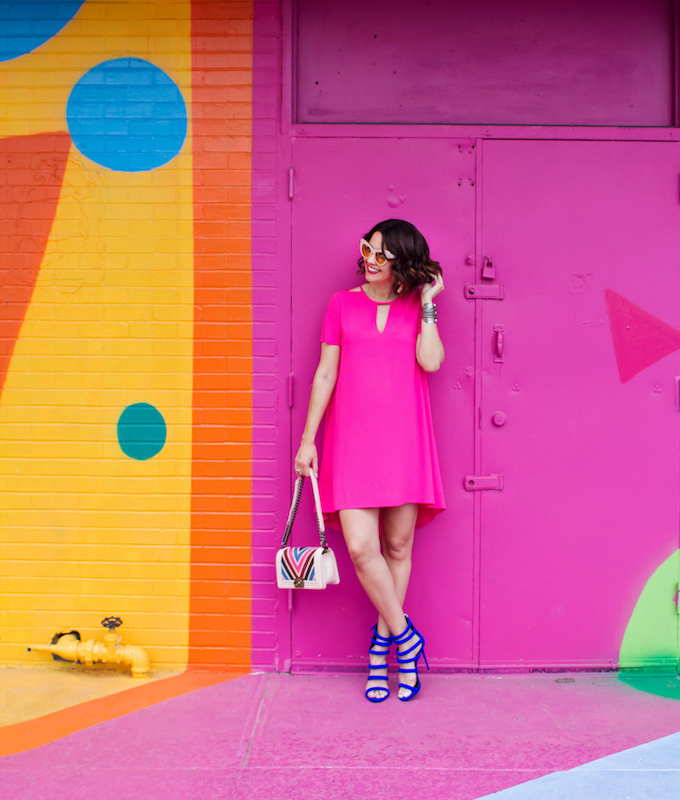 The contrast of hot pink and bold blue is picture perfect. 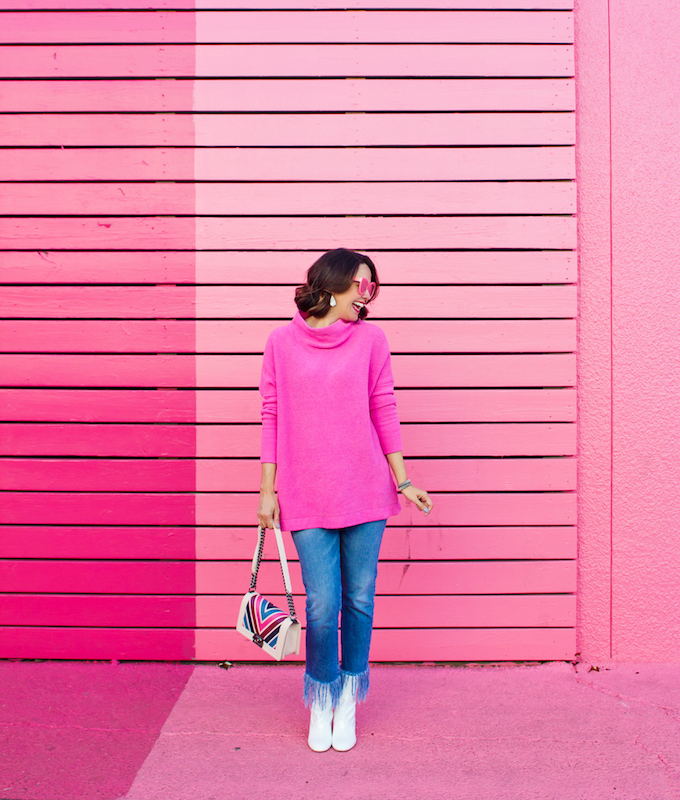 This is an easy way to keep it more casual – simply throw on a pair of jeans with hot pink on top. In terms of pairing jewelry and accessories with hot pink, we love gold. It looks rich and elegant. Similar to cobalt blue, hot pink and navy look stunning together. Another way to tone down the boldness of this color is to pair it with neutrals. 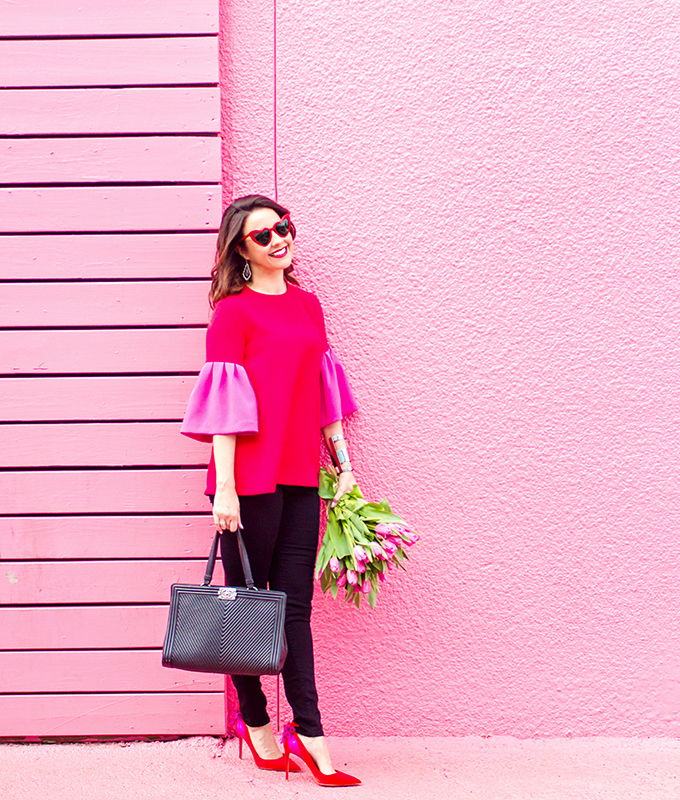 If you’re not fully ready to take the leap into hot pink territory you can start smaller by wearing hot pink as an accent – shoes, bags, etc. Yes, more rainbows, please! 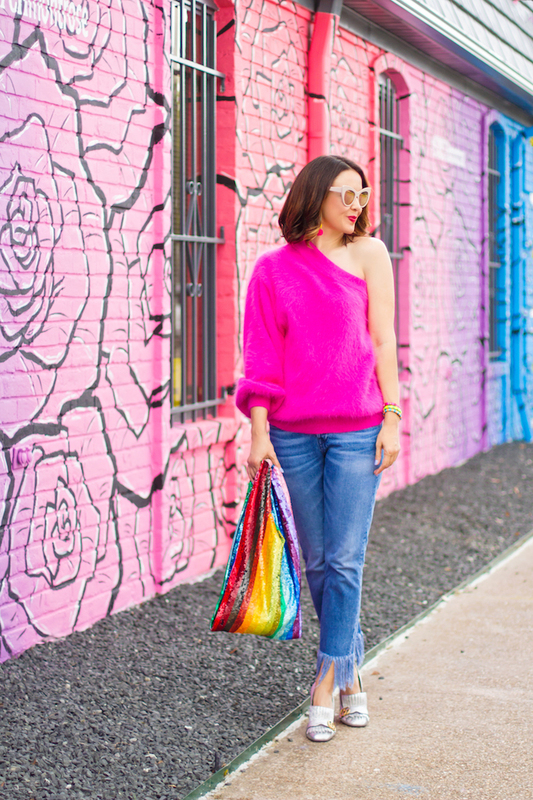 Wear your hot pink sweater or dress with rainbow accessories. 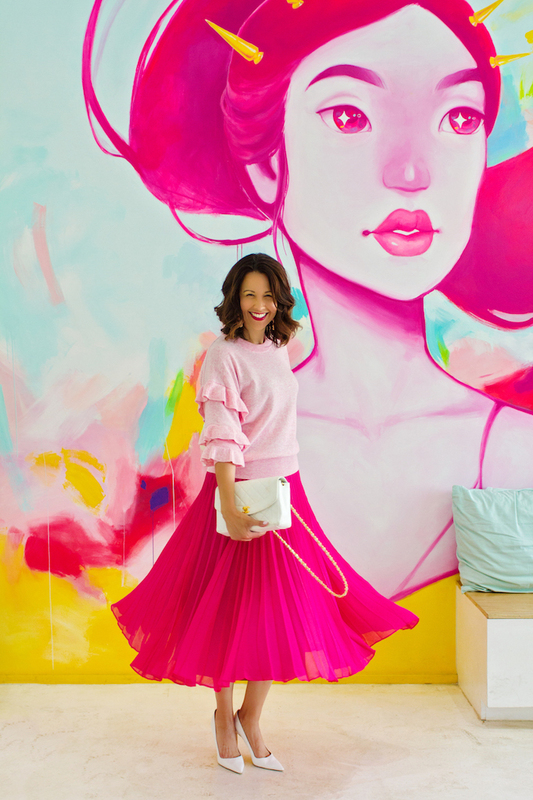 Wearing hot pink in a tonal manner works beautifully – simply pair it with softer shades of pink. Below are some of our favorite hot pink items out there right now, and don’t forget to check out our color of the month boutique here. Now, tell us, what are your thoughts on hot pink? Do you love it as much as we do? What’s your favorite way to wear it? Mine too, Cayla! Thank you! 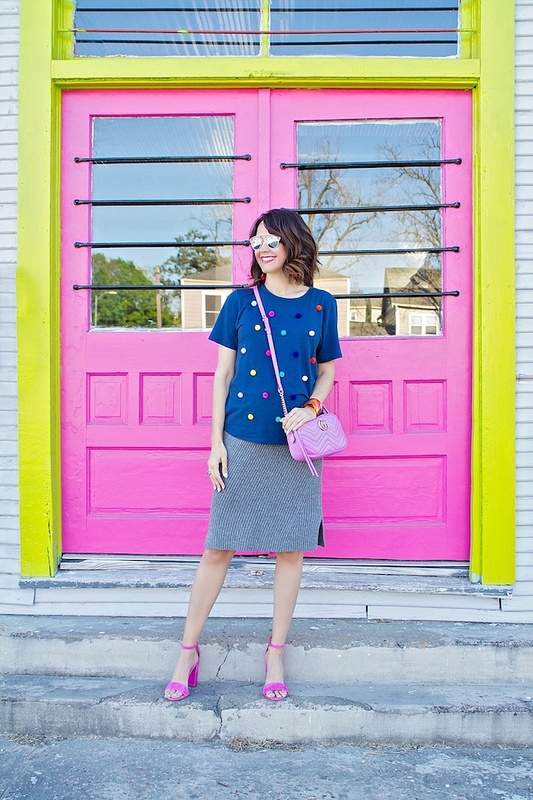 Loving these fun looks-such cute pink picks! Pops of red and blue. 5 tips on how to wear ultra violet.